Steps you can take to recognize the causes of common headaches; lifestyle changes and medications to help prevent and treat headaches. Everyone gets headaches. Headaches have common causes like the foods we eat, stress, allergies and colds, dehydration, weather conditions as well as rarer reasons like thyroid disorders, tumors, over exertion, and blood clots. Whatever the cause, headaches are painful and disruptive. And sometimes a sign of additional danger. 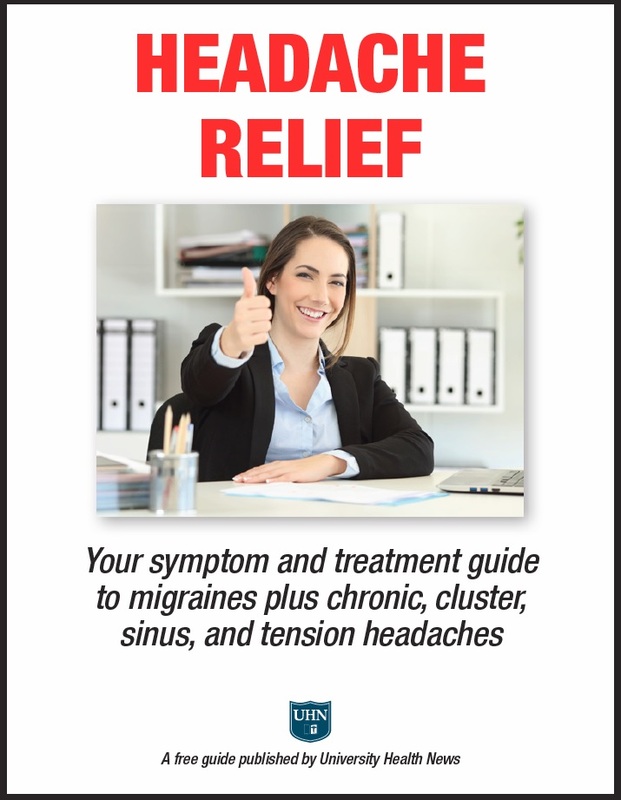 If you are a regular sufferer or occasionally experience headaches but have difficulty feeling better, you are invited to download the new guide – Headache Relief: Your symptom and treatment guide to migraines plus chronic, cluster, sinus, and tension headaches. Free, from the editors of University Health News, Headache Relief is your guide to treating and preventing all types of headaches. When is an OTC pain reliever enough? Can alternate therapies be useful? How can you easily recognize something more serious and know what to do? When should you be worried and call a doctor? In Headache Relief: Your symptom and treatment guide to migraines plus chronic, cluster, sinus, and tension headaches you’ll find the causes and symptoms of the many distinct headaches that can affect you. Migraines are mysterious condition. Affecting more than 28 million people a year, there are many types of migraines with each having various stages and symptoms. Migraine causes vary from hereditary to medical conditions to outside forces. Whatever starts the migraine pain, you want it to be finished as quickly as possible! Let Headache Relief show the way to being pain-free. While being aware of and avoiding your own migraine triggers may be the best cure, many times, medications are the best way to treat these headaches. While Headache Relief brings you information on common medication pain relief options, you’ll also read about prescription options like triptans, beta-blockers, anticonvulsants and new treatments like CGRP antagonists. Tension headaches range from episodic to chronic. And as the name suggests, stress-induced muscle tightness is the likely cause. Pain medications are the most common form of relief but alternate therapies focused on the root causes of the tension headaches are helpful. Learn about the benefits of meditation, massage, biofeedback and cognitive-behavioral therapy for treatment of tension headaches. A sinus headache causes pain at the front of the head, between the eyes, and down the nose, radiating out across the cheekbones. And it is often the result of a sinus infection or allergies. Sinus headaches are usually simple to treat with easy-to-find remedies in the OTC section of your pharmacy. Headache Relief: Your symptom and treatment guide to migraines plus chronic, cluster, sinus, and tension headaches is your guide fast relief. Other Types of Headaches – When Should You Be Worried? Headaches have many causes. And there are many types of headaches. Most are easy to treat and do not occur frequently. But some headaches are serious and have potentially major consequences. If you develop a sudden and severe headache, you should contact your doctor. This is especially true if you recently sustained a head injury, or if the headache is accompanied by certain other symptoms outlined in Headache Relief. Understand the symptoms and consequences of lesser-known headache types like thunderclap headaches, icepick headaches, exertion headaches, weather headaches, brain aneurysm headaches, and more in Headache Relief: Your symptom and treatment guide to migraines plus chronic, cluster, sinus, and tension headaches. Get your copy today! Thank you for the free info in advance! I really need to find out why I’m having so many headaches for days on end. I’ve had a headache for days on end.